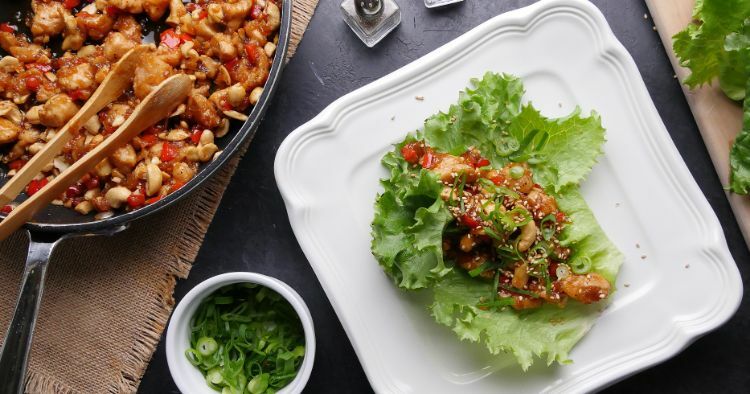 Cashew chicken is a Chinese takeout favorite. Tender chunks of chicken are stir-fried with a savory soy-based sauce, and cashews add richness and texture. 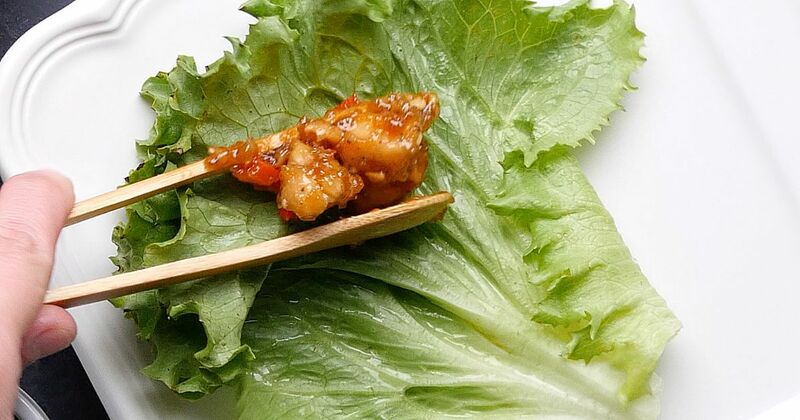 It’s usually served with steamed white rice, but the recipe below offers a low-carb version that’s wrapped in lettuce leaves. In traditional restaurant versions, the sauce for cashew chicken is often quite sugary. Just a bit of honey can do the job of a whole lot of cane sugar. You also can substitute coconut sugar, agave nectar or maple syrup. If you don’t have dry sherry, substitute mirin (Japanese rice wine) or any dry white wine. In a small bowl, whisk together the soy sauce, vinegar, honey, fish sauce, and sesame oil. In a large bowl, toss the chicken with 1 tablespoon of the cornstarch, salt, and pepper. Heat the coconut oil in a large skillet set over medium-high heat. Add the chicken, and cook just until cooked through and lightly browned on both sides, about 3 minutes per side. Stir the garlic and ginger into the skillet, and cook for 1 minute more. Stir in the peppers, reduce the heat to medium, and cook for 3 more minutes. Add the sherry to the skillet and cook, stirring and scraping up any browned bits from the bottom of the pan, for about 3 more minutes, until the sherry has mostly evaporated. Stir in the sauce mixture and the remaining 2 tablespoons of cornstarch. Cook, stirring, for about 2 minutes more, until the sauce thickens. Stir in the cashews, and remove from the heat. Kale is a delicious cornerstone for many healthy meals. It's a basic leafy green, but it's packed full of valuable nutrients that your body needs to thrive.